Knud-Andreassen Baade (1808-1879) was born in Skjold in Norway. At first self-taught, he attended the Copenhagen Academy and became a student of Christopher Wilhelm Eckersberg (1783-1853). From 1829 to 1831, he stayed in Norway and became in 1839 the pupil of J.N.C. Dahl (1788-1857) who had a decisive influence on his art. He settled definitively in Munich in 1845 and became there a master of lyrical moonlight motifs. He was appointed a member of the Stockholm Academy in 1872. This painting is a fine example of Baade’s lyrical landscape characterised by raging storms. It shows a shipwreck on the Norland coast, with a rough sea merging with the atmospheric sky. This painting was most likely inspired by the Norland scenery Baade visited in 1834. The high degree of finish and subject matter are typical of Germanic Romanticism. A boat crashing against rocks on a stormy sea. The Townshend Bequest was made in 1868, according to the Will of Chauncey Hare Townshend. As can be ascertained from the registered files, the bequest entered the museum in that year. In his introduction to A Descriptive Catalogue of the Historical Collection of Water-colour Paintings in the South Kensington Museum (London: Chapman na d Hall, 1876) Samuel Redgrave also gives the date of the bequest as 1868 as does Kauffman in; Kauffmann, C.M.Catalogue of Foreign Paintings, II. 1800-1900 (Victoria and Albert Museum, London: 1973). However in more recent publications the date has been given as 1869, which is the year in which the objects were catalogued. Historical significance: Although Baade's landscapes resemble those of his master, J.C.C. 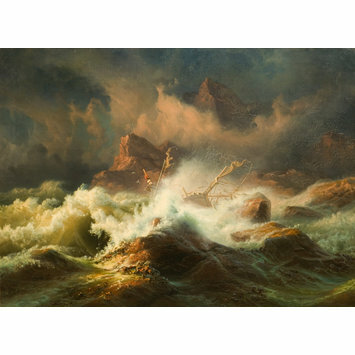 Dahl, they usually present an exaggerated and overwhelming nature in both his calm moonlight views and rough sea storms. In this respect, the present painting is typical of Baade's oeuvre, dominated by hues of dark blue, ochre and white. A similar composition showing the same type of rocky coast in the background is The island Traenen, Nordland, dated 1838, The National Gallery, Oslo. Baade produced stormy seascape mostly in his early career before moving to Munich where his style changed completely as he focused on serene albeit mysterious moonlight landscapes. 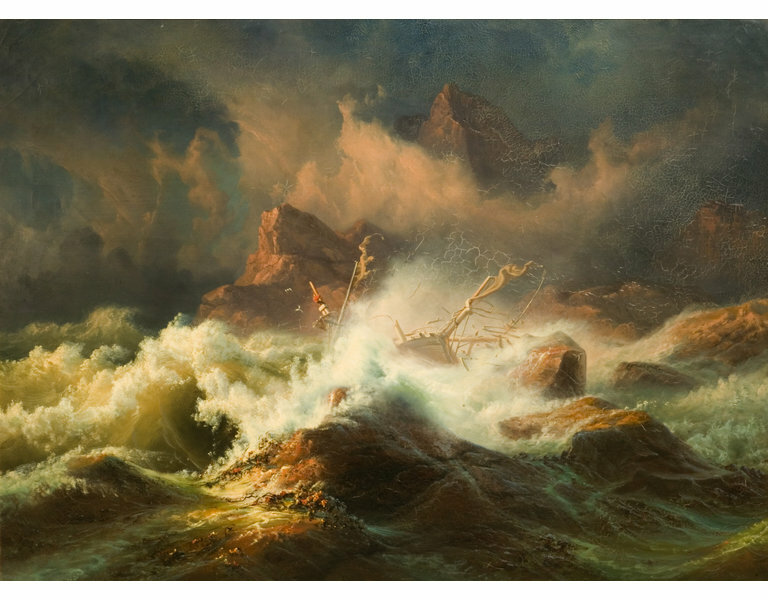 The subject matter, a boat crashing against rocks in a stormy sea, and the compositional formula focusing on the ship being literally eaten by the sea is typical of the Romantic movement, which emphasizes the fragility of man against the omnipotent nature. This painting, along with a later composition by Baade (see 1579-1869), was given by the Rev. Townshend who owns a comprehensive collection of landscape paintings by 19th-century Northern artists. Kauffmann, C.M., Catalogue of Foreign Paintings, II. 1800-1900, London: Victoria and Albert Museum, 1973, p. 2, cat. no. 5. Benezit, E., Dictionary of Artists, vol. 1, Paris, 2006, p. 906.